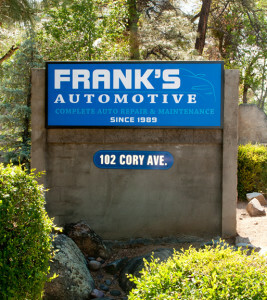 Frank’s Automotive is a family owned and operated complete auto repair shop at 102 Cory Avenue in beautiful Prescott, AZ. Since 1989 their goal is to keep you, your family and friends safe on the road while upholding your vehicle’s value and reliability. Whether you drive a car, SUV, truck, diesel, van, 4X4, or own a fleet – foreign or domestic, Frank’s Automotive has the latest in technology and diagnostic equipment to provide many services. From routine maintenance and oil changes to brake checks, air conditioning repair, check engine or malfunction indicator light on, electrical repairs, radiator replacement, shocks, struts, suspension and steering; they will be there to assist you in all your needs. Did you know that you do not need to take your car to the dealership in order to maintain your warranty? Frank’s Automotive has the equipment and mechanics with the know how to keep your vehicle in the best running order and preserve all warranties from the dealer and manufacturer. Frank’s Automotive has ASE certified technicians and a dedicated team of long term employees that are honest, reliable and are committed to diagnosing and repairing your vehicle properly. With a focus on Customer Trust and Loyalty – Frank’s Automotive believes that the key to success is giving their customers only what repairs are needed or advise on any up coming repairs. They take the time to make sure you feel comfortable and explain all maintenance and work that will be needed and performed. Frank’s Automotive provides shuttle service while they perform services to your vehicle. Alternatively, you are welcome to stay in their waiting room which has access to wi-fi.